Agrilight b.v. has a unique understanding of lighting technology and the targeted use of lighting for different types of livestock. Light intensity, light distribution, day length and light colour all have implications for animal welfare and therefore animal behaviour. The right balance between these four factors has a positive influence on livestock. Correct, uniform lighting helps to improve health and productivity, amongst other things. 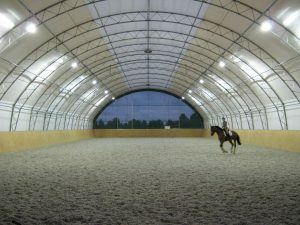 We are regularly asked what is the best advice about lighting within the horse sector. Independent research has shown that a minimum light level of 150 to 200 lux is best in stables. This light level, combined with a lighting regime of 16 hours of light followed by 8 hours of darkness, produces positive results which are described below. Extending the day length by means of appropriate lighting influences melatonin production. Melatonin is also known as the sleep hormone. Light inhibits melatonin production and darkness accelerates it. In other words: more light means less sleep hormone and therefore healthier, more active horses. Horses also need visual contact. In dark stables there is less opportunity for (visual) contact with other horses. This can cause horses to develop stable vices such as weaving, cribbing and wind sucking, which are often caused by boredom. Lighting also plays an important role in breeding because it has a significant influence on hormone levels and fertility in horses. You can extend the day length by implementing a lighting regime of 16 hours of light at a minimum level of 150 to 200 lux, thus preventing the proverbial winter dip. Mares are then more likely to come into oestrus. Horses also grow a thinner winter coat, which makes a significant difference in terms of work and costs, e.g. for rugs and clipping. Agrilight b.v. fixtures have been designed so that you can light several boxes with a single fixture. 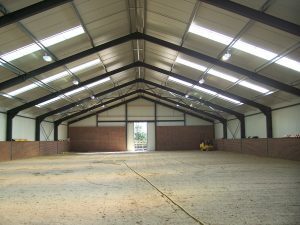 It is particularly important to have uniform light distribution in indoor riding arenas. 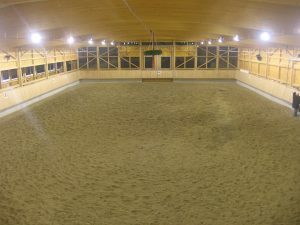 One of the most important points to consider in indoor arenas is the prevention of shadow and ‘light circles’.